Moments & Musings: "Peter and James in a Fishboat!" "Peter and James in a Fishboat!" Today marked the 1 month anniversary of Sir starting a new job. It was also the day the kids and I decided to drop in on him at work to say 'hi'. Ok, it wasn't exactly 'dropping in', he knew we were coming and had even given us loads of advice on how to get there the best way. You see, Sir's commute is between 75 and 90 minutes one way, and to get there he takes the bus to the skytrain, the skytrain to the seabus, and then walks the last block or so from the seabus to his office building. 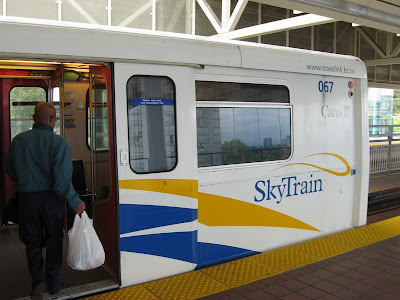 So, when the kids and I were going to come visit him, we drove to the skytrain and did transit from there. Today was the first day I went anywhere on the public transit system by myself. All the other times (if you don't count the greyhound bus ride from California to Manitoba 10 years ago) I've always had Sir to do the worrying and organizing. I started out planning on giving ourselves an hour and a half to get there hoping to meet Sir for lunch around 12:30ish. Only, we didn't actually leave the house until 11 and then we had to stop for gas so we could get to the skytrain station which is about 15 minutes from home. Once we got to the skytrain, found a parking spot, paid for parking, unloaded into the double stroller and figured out how to get from the parking lot into the station, I'm sure we'd wasted a lot more time. In fact, I think my clock said 11:41 or something like that. The first order of business, I thought was to find the elevator so we could get up to the platform. We walked right past it and tried going to the one that was being used only for the test train side of the station. After an employee kindly pointed us back to the right elevator, we scurried off and up to the platform only to discover I had no idea where I was supposed to 'validate' my transit ticket. There was a train ready to go when we got up to the platform, and we walked its length twice looking for some place to validate our ticket before finally deciding that maybe we should have checked the first level. So, we took the elevator back down to the main floor and walked its length twice. We found the ticket machines where you can buy a ticket, but they didn't have any directions on validating one. So, then I figured it would be wise to ask for help, but there weren't any employees around just then and we ended up waiting in line at the snack shop to ask the cashier. She smiled and pointed at a long line of blue boxes behind me next to the elevator - I felt like an idiot, but smiled back an scurried off to one of the boxes that I'd absentmindedly chalked up as recycle bins. By this time at least 5 trains had left the station and I believe they run about 3 minutes apart. We validated our ticket, took the elevator up to the platform and then had to wait a good 5 minutes before a 'not in service' test train left and a in-use train pulled in. Through all of this, all three of the kids were being exceptionally good and we found a nice spot on the skytrain that fit the stroller without too much fuss. The next leg of the journey was the 40 minute skytrain ride from one end of the line to the other with me explaining how many more stops we had left to go each time we pulled in and out of a station - but the kids loved it. When we got off the skytrain we headed toward the seabus dock except the elevator from the train platform to the seabus was broken. Sir had warned me about this, and I had decided to just fold up the stroller and take the escalator. I was in the process of unloading the kids and was about to fold the stroller when a man asked me if I could use some help. I was glad to accept. I gave him my stroller, grabbed my three kids and went down the escalator - just like that. We thanked the stranger, loaded up into the stroller again and headed on toward the seabus - into a crowd of people coming the opposite direction. They were the passengers of the seabus that was by that time now returning to the quay with a load of people going the way we were headed. So, we waited the remaining 10 minutes for the next seabus to arrive, and had no trouble getting on and finding a seat. 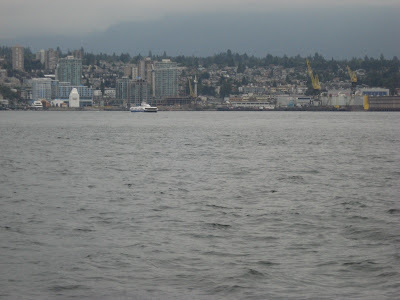 Sir called me on the cell phone just after we'd gotten off the seabus on the North shore to see how we were doing. It was already 1:15 and he'd expected us between 12:30 and 1. Then was the short walk up the steep hill to Sir's office building, up the elevator to his floor and then finding the right office - we were finally there by almost 1:30. Sir let us in, we met some of his co-workers and then left to grab some lunch to eat in the park, just below his office building, overlooking the river. It was nice to see Sir in the middle of the day and the kids loved being able to eat lunch with Daddy. Finally he had to go back to work, I washed the kids up, we all said goodbye, and then I let them play for a few minutes while I packed up the stroller and figured we had a couple minutes to spare before we needed to head back to the seabus. Except, just as I was planning on heading back to the seabus, a regular train thundered by (on the other side of a fence) next to the park and PC raced off to watch it. 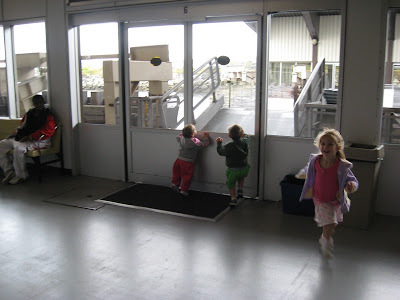 There had already been two other trains that had gone by and he'd watched them as well, but he couldn't hear me calling him back and by the time I went and got him, and got all the kids back to the stroller, we'd missed our seabus and had to wait for the next one. It was 3:15 when we got on the seabus, and started our backtracking. Up the escalator - no trouble there, to the skytrain where we got on a newer model train that seemed less stroller friendly so we got off at the next station and waited for the right train to come along two trains later. The kids were still being good despite being so late for naps already. 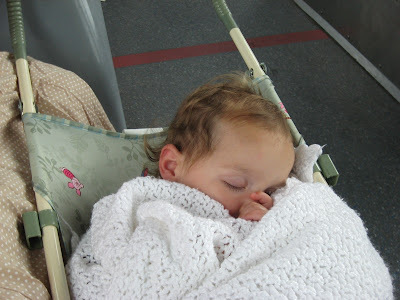 Emma fell asleep in the stroller on the skytrain ride home, and Dolly reclined in the other stroller seat while PC bounced between his seat and my lap and the window the whole way back to our starting station. Between explaining how many more stops there were till we would get off, I read a book I'd brought along and probably got 5 or 6 pages read which was nice. By the time we got home it was quarter to 5 and I put the kids down for a late nap. Sir would be working late, and so supper would be late as well. Emma never went back to sleep, but I had to wake the other two up eventually. After Sir got home and the kids were ready for bed, they went in to say goodnight to him. I came in as he was saying good night to PC and heard him say, "Thank you for coming to see me at work today, did you have fun?" PC nodded and cuddled closer in response and Sir continued, "What was your favorite part of the day? What part was the most fun?" PC sat up beaming and said, "Peter and James in the Fishboat!" Sir and I looked at each other slightly puzzled and then it dawned on us that PC thought he'd actually met Peter and James - from the bible story - at Daddy's work today. One of his co-workers was a fellow Hungarian named Peter and the leader of Sir's division was named James. Peter and James -- that's great! It's fun catching a glimpse of what a child Actually is thinking, sometimes. That must have been quite the day! Good thing kids love adventure. PC's comment is adorable. Interesting lyric and tune changes in that youtube video! They missed the "Jesus said cast your nets on the right side" verse and added one about calling their friends to help them. Did that part even happen in the bible? I can't remember! You are brave! That does sound like a (very tiring) adventure! The photo of Emma sleeping is adorable. Ioi! You make me tired just imagining the time you had...what a terrific adventure for you and the kids. I loved every word, especially they way you handled the setbacks. Chatty; they mixed up/combined the incidents...after the resurrection (john 21) the Lord told the disciples to 'cast on the right'. After the Galilee discourse (luke 5)the Lord told them to cast in their net(s) they cast in only one and it thus broke, so they asked for help. P.S. I find myself shamefully filled with that same unbelief.